Endothelial Defense with Full-Spectrum Pomegranate and CORDIART is a dietary supplement used for nitric oxide production supporting normal vascular function. Endothelial Defense with Full-Spectrum Pomegranate and CORDIART is recommended for those supporting normal heart and endothelial function. Life Extension Endothelial Defense with Full-Spectrum Pomegranate and CORDIART is a comprehensive support for nitric oxide production supporting normal vascular function. Normal heart function depends on many factors, including proper endothelial function. Aging individuals need to keep youthful integrity of their endothelium, the thin layer of cells lining the interior of the entire circulatory system. The new Endothelial Defense contains standardized pomegranate juice extract and a proprietary pomegranate flower and seed oil blend. These extracts from different parts of the pomegranate plant provide potent polyphenols clinically shown to support normal blood flow, youthful lipid and glucose metabolism, and normal inflammatory factors. CORDIART is an extract from sweet orange peels activatates endothelial production of nitric oxide, which signals the smooth muscles to relax, inducing vasodilation to support normal circulation function. As a dietary supplement, take two (2) softgels daily before breakfast, or as recommended by a healthcare practitioner. CORDIART flavonoid glycoside [from immature sweet orange (peel)] [std. to 90% rutinoside (450 mg)] 500 mg Other ingredients: extra virgin olive oil, gelatin, maltodextrin, glycerin, purified water, sunflower lecithin, carob color, beeswax. Endothelial Defense with Full-Spectrum Pomegranate and CORDIART product is available only from licensed healthcare professionals. 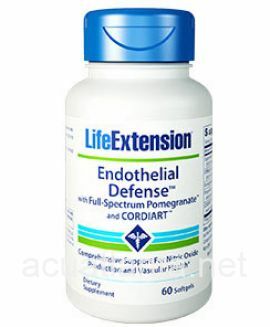 Buy Endothelial Defense with Full-Spectrum Pomegranate and CORDIART Online here at AcuAtlanta.net or our clinic.